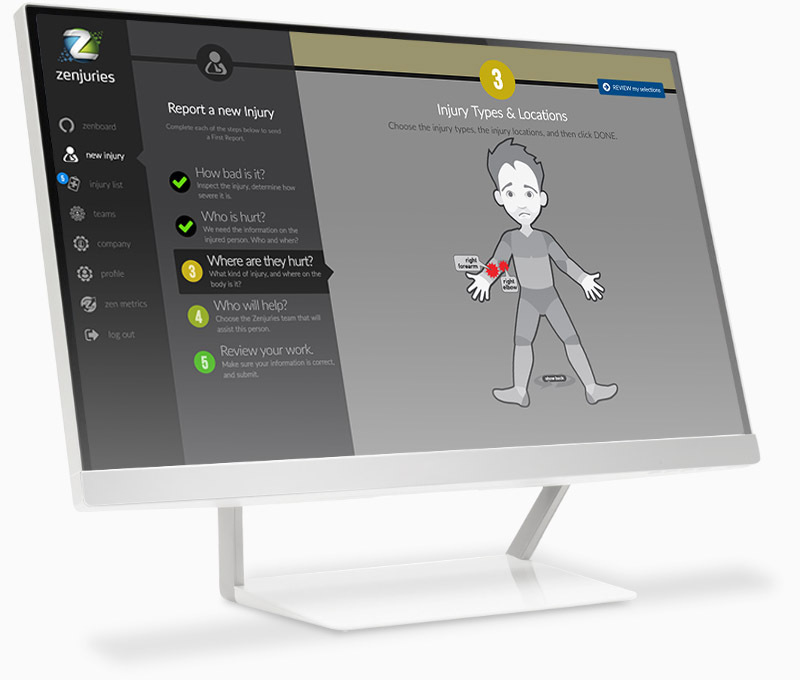 The Zenboard is your action center to report injuries, view all outstanding injuries, see where costs are occurring, and find out if everyone has done everything they need to in order to move every injury to resolution. 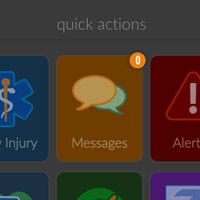 Numeric badges let you see at a glance how many messages you have, and what you need to focus on first. Friendly interface with easy to identify unique user icons. Fully customizable. Customizable quick actions allow users to get the most important things fast. 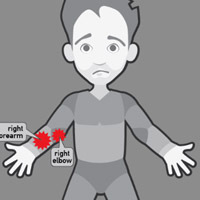 Zenboard list shows critical items first, and allows direct access to each injury. As soon as an injury occurs, you want a quick and easy way to record all of the basic information to get First Report process started. 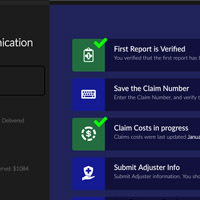 The Injury Wizard walks you through 5 steps to get you from injured employee to an in-process injury report in seconds. Get the First Report finished and sent in record time! 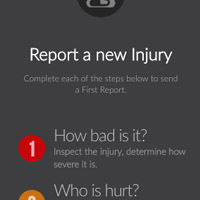 Step by step instructions to take any uncertainty out of injury reporting. 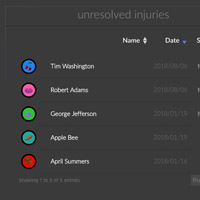 Clickable injury user interface allows for quick reporting of injury locations. 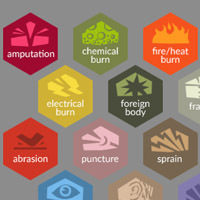 Easy to identify injury type selector covers every reportable injury. 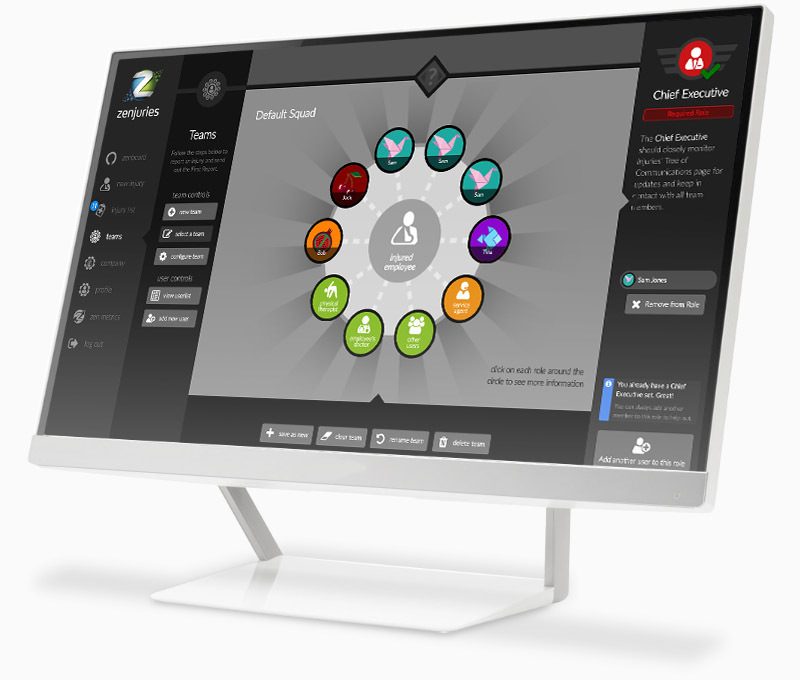 The Circle of Care is the team of Zenjuries users that surround your injured employee. 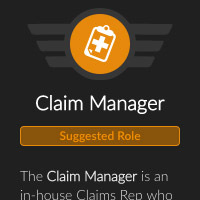 Using the Teams interface, you can assign members of your own company--as well as outside members like insurance agents and doctors--to your injured employee's injury case. Everyone surrounding the injured employee with care! 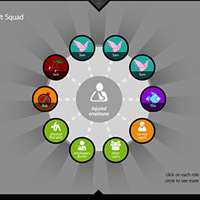 The Circle of Care lets you surround the injured employee with support. Assignable roles ensures that the right person is responsible for the right job. Every user on the system can be assigned and contacted directly with ease. 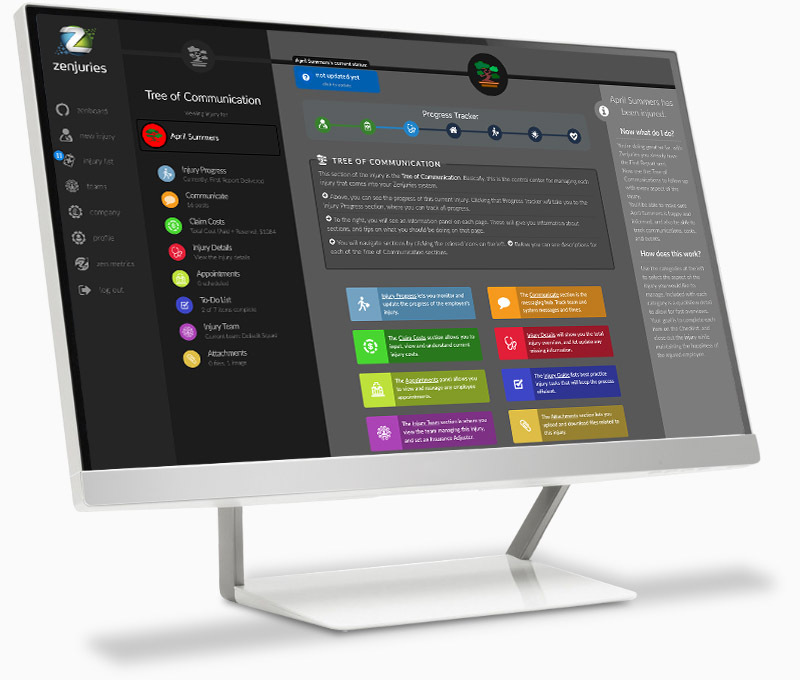 The Zen Tree of Communication is where every communication, every process, and every file is recorded for your employee's injury. 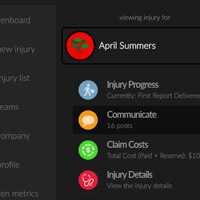 It lets you chat with the injury team and the injured employee, see what has to be done next, and make sure everything is being done to get your employee back to work. Clear and direct tree functions that manage and document every injury. 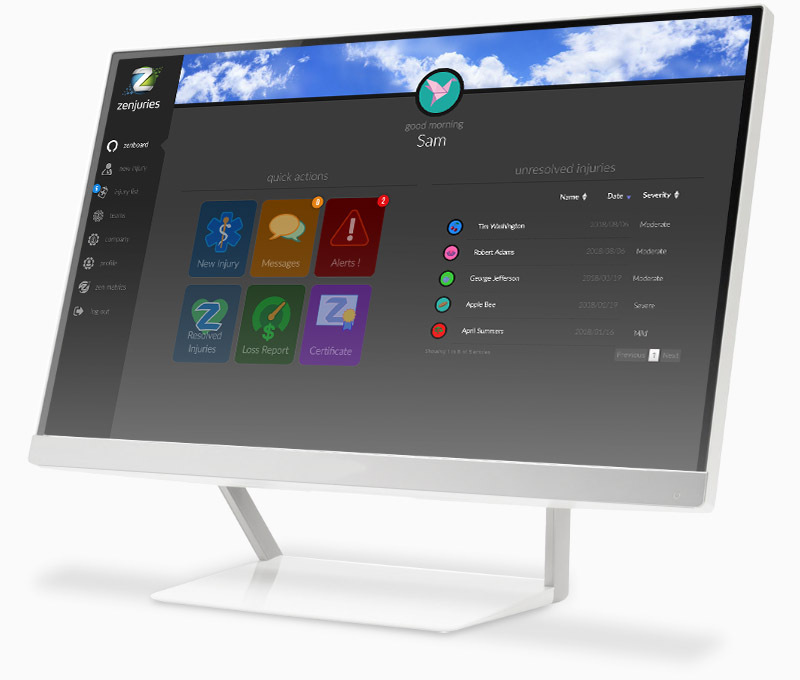 Real-time messaging system allows for immediate updates and trackable history. Helpful best practices task list to promote positive progress of injuries. 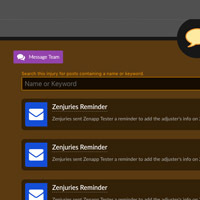 The base application that controls all of Zenjuries. Easy to learn, enjoyable to use. Request a demo or get it now! 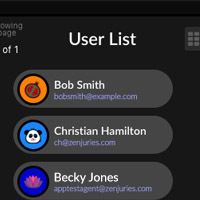 Request a demo of Zenjuries Core Application. You will be contacted shortly after submission to schedule your demonstration.